How to Display Combined Labels in Blogger? ~ The Blog Doctor. 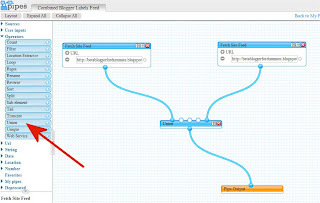 You are here: Home > Yahoo Pipes > How to Display Combined Labels in Blogger? How to Display Combined Labels in Blogger? 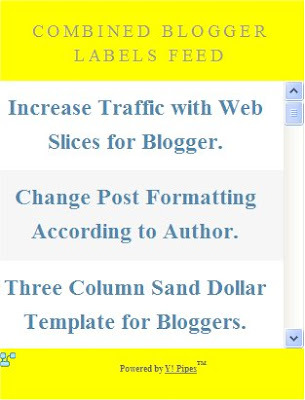 Labels are used in the new Blogger to categorize posts according to categories. Clicking on a Label in the sidebar displays all posts associated with that label. To combine the above two go to Yahoo Pipes and register. Click 'Create a Pipe' link at the top. The drag and drop interface will open. Click arrow before 'Sources' in the sidebar. From the drop down list drag and drop two 'Fetch Site Feed' modules from the sidebar onto the interface. Copy and paste the Label URLs of the Labels you wish to combine in the modules. If you want to use Label Feeds use the Fetch Feed module and paste in them the Label Feed URLs. Save the pipe by clicking the 'Save' link at the top right of the interface and give it a name. Hi, Vin. This looks interesting, but I don't understand what is the use of the pipe created. Where have you put it in your blog? Is it a new label in the label cloud? I have added it in another blog. It is a list of Post titles (linked to the corresponding posts) associated with both the labels. Thanks, Vin. I've tried now, but it doesn´t work for me: I only get the first 25 posts in every fetch site feed and the label I put does not have any effect. I have even copied exactly your line and I receive all your firts 25 post, it doesn´t matter the label I choose. And I've seen another difference: when I use your blog I see the titles of the posts but with my blog I see the initial content and some pictures. Let me know the blog address and which labels you wish to combine in the blog and I will give you the code to paste in a Html page element. It depends on what your blog feed shows. My blog feed shows only titles. I have understand the difference between your feed and mines (but I don´t know how to change them if I need only titles). And about your proposal for making the code, I was only testing your idea, so I don´t have any final requirements. I prefer you to explain why the label doesn´t work for me even using your blog address, but if you prefer testing my blog, I tried with tomat5.blogspot.com and label Top and join with the same label in another blog, first with tomat4 and then with your blog and your label, but it never worked as expected. Try customizing feeds at Feedburner.com. Email me for the code for the combined labels. My email address is in middle column. You can see the combined feeds of the 'Top' label from tomat4 and tomat5 blogs here. Thanks a lot for your time, Vin. The pipe you did is exactly the same I tried, and the results are the same. You can check in the original blog that the first post in the pipe (and others) hasn´t the "Top" label. It´s just the first post in the blog. Even in your example, I think the first post "Increase.." hasn´t the "Template" or "Widgets" label. There was an error. I have corrected it. You can check it out now at the same link as in my previous comment. OK. It works fine now with the Fetch Feed. Thanks. I suppose there's no handy-dandy URL for displaying posts with two specific labels? Here's my blog: http://readinginbed.net (It's in a frame, so the URL never changes if you click internal links, btw). I have several labels, but let's say I want to show all posts that have two specific labels, "book" and "fiction". Is there no way to do this without using Yahoo Pipes?